Are you searching for a quality canine lead? Do you need reliable leash easy in cleaning? 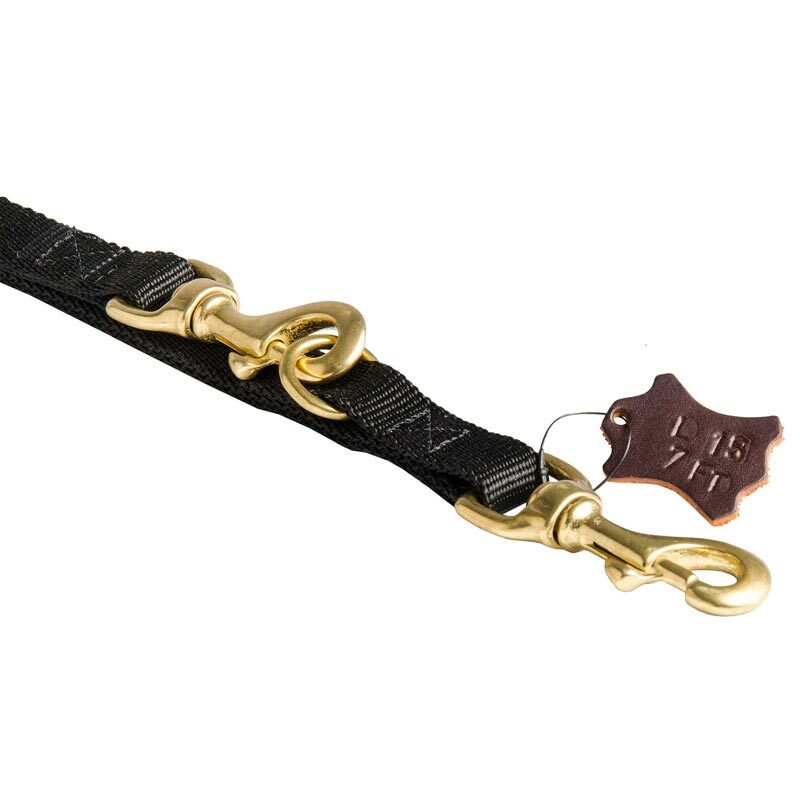 Do you want your canine lead to be comfortable and multifunctional? Then try this Multimode Nylon Dog Lead. Traditional classic design known for its complete functionality. 2 ply durable nylon is stitched at the stress points for extra strength. No rivets or glue is used, so you may be sure in quality of presented item. 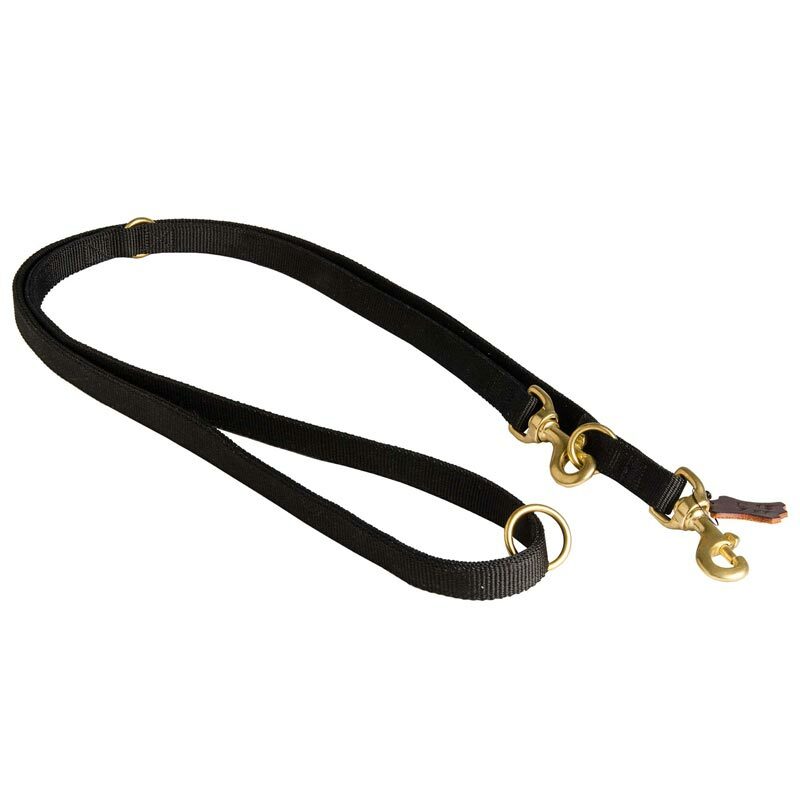 The leash is equipped with brass fittings, i.e. rings and snap hooks, for better functionality and, actually, for more modes available. Thus, several rings and 2 snap hooks make it possible to use the leash as a short leash, as a teather stuff, as a coupler and just as a reliable and comfortable daily control item. 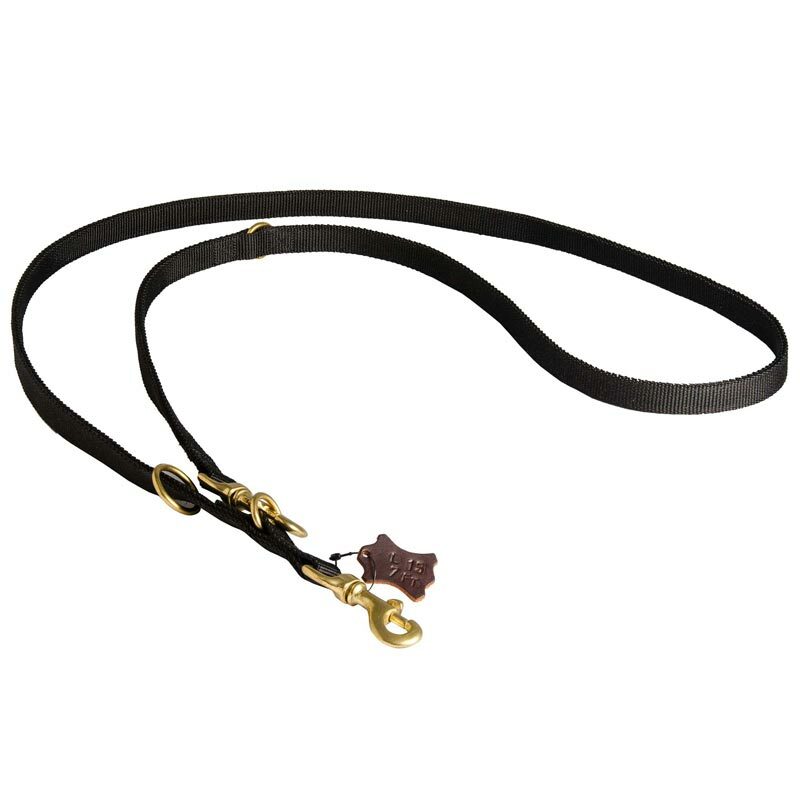 Strong solid brass or stainless steel snap hooks will give you feeling of safety and make this leash super reliable. It's important to mention that rain, snow, high humidity and other natural conditions cause no problems to this leash. Do not let weather become your obstacle in effective training process. Easy to wash, this leash will look gorgeous at any time having its qualities always top level at that. Over the shoulder leash: Bring handle end over your shoulder opposite to the side you wish to walk your dog, across your back and up under your armpit. Attach that leash clip to the floating O-ring to make a loop across your upper body. Attach your dog to other end and get ready to go. 3.5( 105 cm) ft leash: Attach the clip on the handle end of the leash to the O-ring which is sewed into the other end. Tether: Wrap the leash around an object. Attach the clip on the handle end to the floating O-ring. Never leave your dog unattended while tethered. 20" traffic leash: Make a 3.25' Leash and then grab the floating O-ring and slide it to the end of the leash opposite the clipped ends. Now bring the O-ring back to the clipped end essentially folding the leash in half. Clip the floating O-ring using the same clip that is attached to the fixed O-ring. 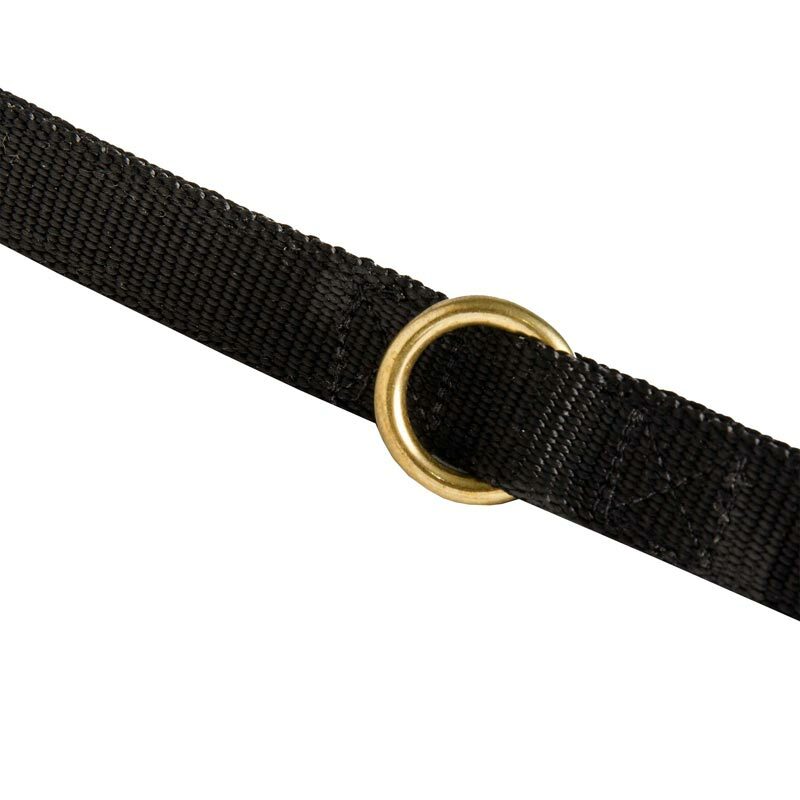 Waist leash: Wrap leash around your waist and clip the snap hook to the floating ring. Clipping the snap directly to the floating ring will help it stay put instead of falling down like a loose pair of pants. Attach your dog and everything is ready for action. 7ft (210 cm) leash: As it is - you can also attach one of the snaps to nearest ring to create traditional handle.